This past weekend, Willis and I had a table at Super! 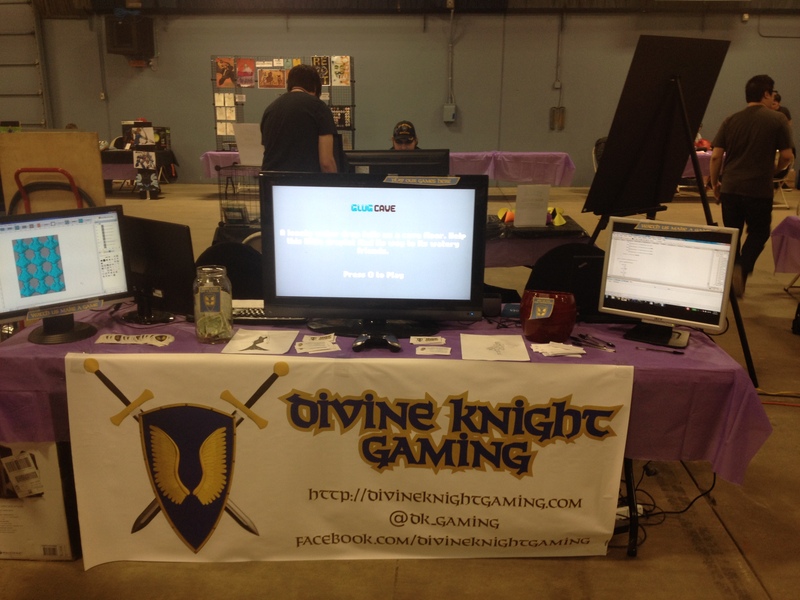 Bitcon, the local retro/indie gaming convention created and operated by the Oklahoma Retro Gamer Society. This is a great event for anyone who loves gaming. We decided that getting a table there would be a great way to build up buzz and brand recognition for our company as we really step up our development efforts this year. As such, we got this table and decided to show off some of what we have done. For this we needed something to show off. We had a number of games that we made last year, but we needed them to be in a convenient game playing package. So what we did was we took one game we made last year, and then based our entire demo station off of it. 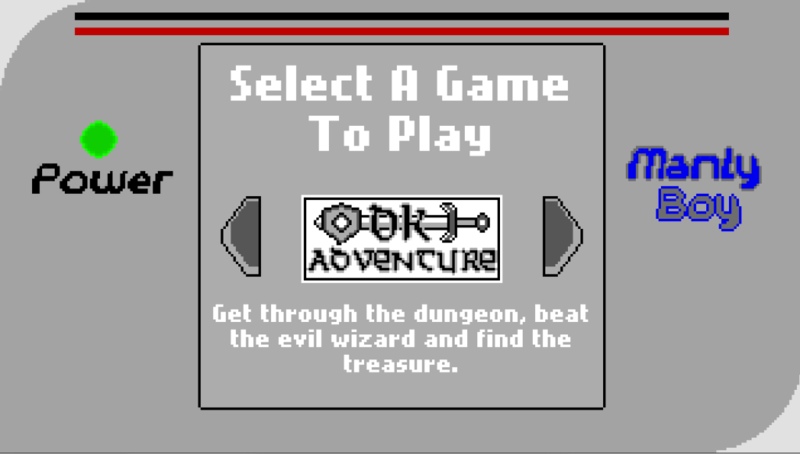 So we took our Amazing Mazes game, put a fun mock-Gameboy border around it and then added two new games to go with it. As we described in our last post, this was a retro styled vertical shooter and an adventure game prototype we made as we prep for our next game project starring Charnette. This setup was a really big hit. We had a lot of people come by to play these games and we received some great comments and some critique. One of the best things is that people loved the Manly Boy theme we put on all the games. We got a lot of great laughs as people reminiscenced about the classic Gameboy. But that was not all we did. We also wanted to do something no one else at the Con was doing. We decided to do a personal game jam over that weekend. 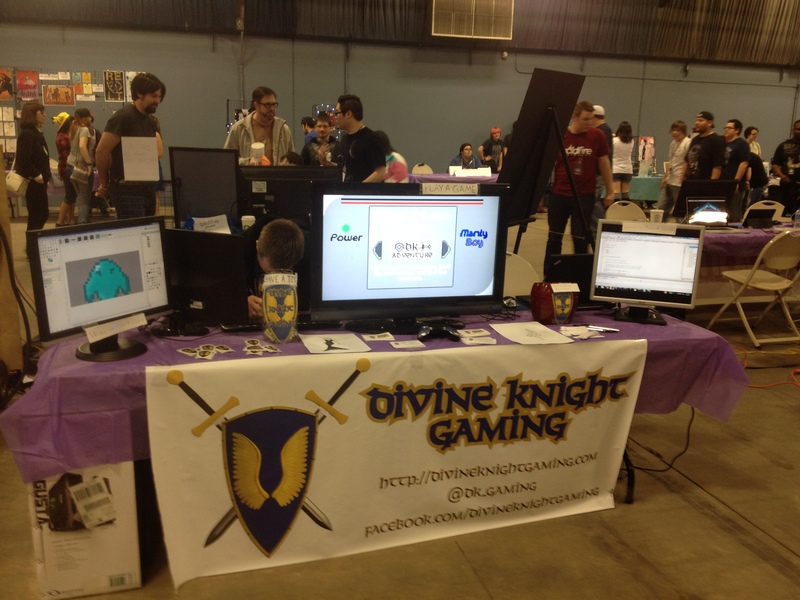 We set up each of our dev stations with two monitors, one facing us and the other mirrored and facing the convention goers so they could see what we were doing. To start us off after setting up the booth, we picked one of four themes from a bucket and then one of four genres. With that, we picked a Water theme and an Adventure genre. This was a good pick for us as our major game project is an adventure game. So we set out to make something water themed and adventury. 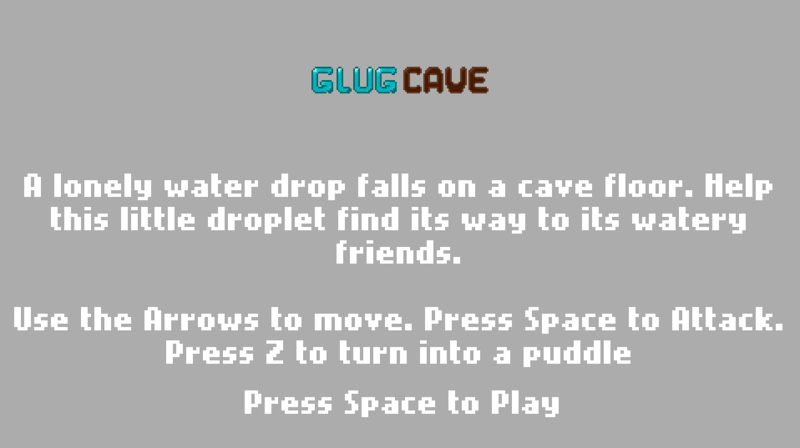 After about 30 minutes or so of brainstorming, we came up with the idea of a water drop trying to find its way through a cave and back to its watery friends in the underground river/puddle/lake thing. This was a pretty great experiment for us as the two of us haven’t sat together in the same room making a game at the same time. Neither have we set such a deadline for ourselves to complete a game. The first day was a pretty interesting experience. The first hour or two was spent fleshing out the game idea which you can read our notes in this Google Doc. These notes are really simple but straight to the point. We had to make sure that what we did can be made in the roughly 13-15 hours of the event. Once the planning was done, we began work on the actual game. By the end of the first day, we had a slightly playable prototype going on. We had a walk animation for our main character and the basic logic of the little fireball enemies. Once the second day rolled around, we really stepped up our game. In the first two hours, we had the main character fully animated with the two player abilities, a water slash and a puddle transformation, programmed into the game with two game objects that require those abilities to bypass. Then we go our fireball enemies working. Unfortunately, these guys had a number of bugs associated with them that took a lot of work to try and fix, although we were unsuccessful in fixing them completely over the weekend. By early afternoon, I was busy adding a few convenience features and controller support so that convention goers could play the game. By the last hour, we had the game, as it was after 13 hours of development, playable on our main screen. We had a few people come by and try it out. We didn’t have too many people play as the convention was closing and most people still attending were in the vendor room trying to score last minute deals on classic games. But we got some good feedback from those who did play. Overall, it was a great experience for us. It was a great team building exercise for us. It helped us get a better feel for working together more closely and during a deadline. So let us take a look at what we learned during this event. The game jam was a really great way to get people to our table and keep them there as they would ask us questions about game development. People responded really well to this. Having a game to play at our table was a great hit. Especially with it being three games in one. We had a lot of people come by and play all three games. The game jam itself was a lot of fun and we made a good product that I think, with a little more polish and some added features, would make a fun completed game. We had a bucket for people who wanted to sign up for a newsletter. We got a fair amount of emails from that. This is a great way for people to keep up on our work as well as build word of mouth for our up coming games. We had little fliers with our website, Twitter and Facebook accounts on it. 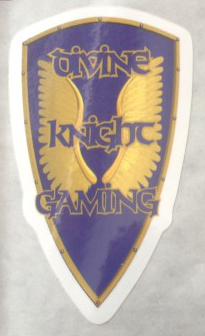 We handed out a lot of those and have already had an uptick in followers on Twitter and Facebook. We got a lot of feedback on our Manly Boy games. Because two of them were somewhat competitive as there were top scores, we would have groups of people competing with each other to get the top score. This kept a steady flow of visitors to our table and kept us busy. We knew our tools and the limitations of them and had few hangups. This is key for most any game jam. Many developers fail to complete game jams because they try learning something new during the jam rather than work with what they are familiar with. 15 hours just isn’t enough time for a game jam. While it was a great idea and people loved it, we probably should have started the game jam the Friday before so that we were further along first thing Saturday morning. With only 15 hours, we really didn’t get as much done or get it playable for convention goers soon enough. I took part in a game development panel on Sunday afternoon. While the panel was great and I loved the experience, it really cut into game jam time and delayed playable launch of our game that afternoon. If I were to do a convention jam like this again, I would either not be on a panel or prefer to have it on Saturday. We had a tip jar on our table in the hopes that people would drop a dollar or two in it as they played our games. Unfortunately, this was not at all successful. We made about $3.50 off this. We talked about this as we were closing down and felt that we would have made more money if we had something for sale rather than a tip jar. Next time we go to a convention, we are going to have CDs/DVDs with the game(s) we have on our demo station. We think this will be a better way to get people to hand us their money. I take part in a podcast on Saturday nights and did so the Saturday night of the convention. This again cut into time we could have spent on game development. If I do a convention jam like this again, I will likely have to cancel any kind of appearance on a podcast for that weekend. While we knew our tools and their limitations, we weren’t able to compensate for some of those limitations without ugly hacks. 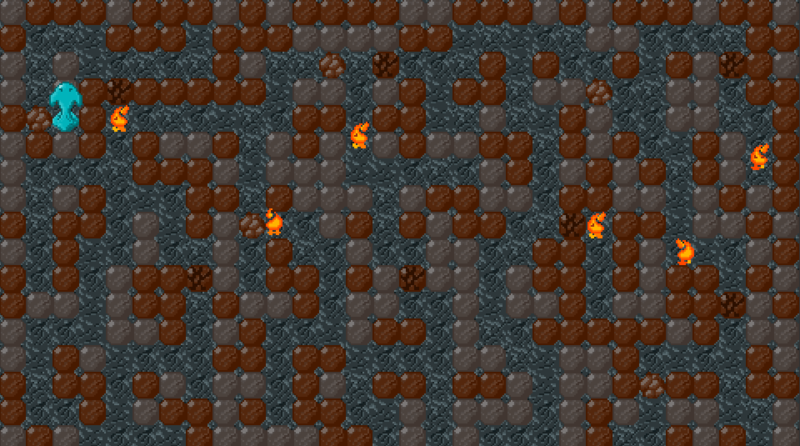 For example, the character we used was 16×32 pixels, but the game level was based on 16×16 grids. This caused some issues with the implementation of the collision detection between the player character and their surroundings. To compensate for this, we cut the player into two sprites, the upper half and lower half. This allowed us to overlap the top half with the level and base collision detection on the lower half. But it also introduced a lot of headaches to animating and playing the character that wouldn’t have been there if we used a single sprite. We had stickers at our table, but they just were not that popular. I think that the limitations on use (they can only be stuck somewhere once) was the key factor. Something reusable like a button or badge or a toy would have been better. The developers behind us had paper beaks that people could get (their game was a bird themed game) and people loved them. We saw tons of people around the convention with them. We would have loved to have had something like that for our table. Having a game on display for people to play was a great idea. However, one should spend more than a few nights a week for the two weeks before the convention to put it together. I was busy almost every night the week before getting this game ready for the convention and was up super late on Friday fighting to get the game running on the hardware I wanted to use. Eventually I was unsuccessful and had to switch the demo station hardware around and I ended up with a subpar machine for my work station. This hurt me as a developer as I had to struggle with a keyboard layout I didn’t like and software I don’t use regularly. So we need to make sure the demo station works long before the jam so there are no last minute surprises. Next time we do a convention jam like this, if we do it again, we need to plan and bring our own food. We ended up having to hunt down food which cost us development time. Bringing a sack lunch and some snacks would have been much better. One thing that makes game jams work is regular updates to social media during it. We completely failed at this. We posted no updates to Twitter or Facebook during this at all. We should have planned on posting one update to each platform every hour. It would have only taken a few minutes to take a screenshot and write a short sentence or two about the game and would have been worth it. When doing a game jam of any sort, it is good to have goals set for the entire length. We had a single goal of “This game will be up and running on the demo station by Sunday afternoon”. Things probably would have been better if we had some sub goals for specific milestones during the time between. This game jam taught us a lot about what we need to fix for our upcoming game. We decided to base the resolution of the jam game and its sprites on what we have planned for our current major project. That was a great idea as it taught us both a lot about what we can improve and avoid in our adventure game. We are happy to have learned these lessons now rather than learn them when it is critical for our other project. This was our first convention and first game jam as a team. Now that we know a few things about both events, we feel a lot more confident going into other ones in the future. We might not ever do a convention jam like this again, but I would say no if the opportunity came up again. Would we do a game jam again? Yes, definitely. We loved the experience and the break from our current project. It got a lot of creative juices flowing and we just could not stop talking about our next game and what we can do to improve it. Would we get a table at a convention again? Absolutely. This is a great way to meet and talk to people and get them excited about our work. In person marketing like this is wonderful. We just need to make some better choices about what people can get from us. Would we combine the two again? Maybe. I think the experience was great and the fact that it was unique for the convention really helped us out. It was also something interesting as our current project is not anywhere near convention stage. We plan on having a playable demo later this year and I think we would much rather have people playing that and investing time and money towards its development rather than be distracted by a game jam during the convention. Would we recommend a convention jam to other developers? Only if they really want to. Take a look at our lessons learned and see if you are prepared for all that. If you still want to try it, by all means go ahead. I wouldn’t trade the experience for anything (expect maybe for a giant pile of money ;).